Panera Bread, a popular lunch spot at 1063 Post Road, near the Corbin Drive/Post Road intersection downtown, will be closing up and leaving by the end of the year, Darienite.com has been told. Panera Bread restaurant’s sign at the front of 1063 Post Road. The store, which also has take-out service for its bread and other items, has been renting 3,754-square-feet — the entire first floor of its building, since 2007, when it became the first Panera Bread restaurant to open up in Connecticut. The chain now has almost 2,000 locations. 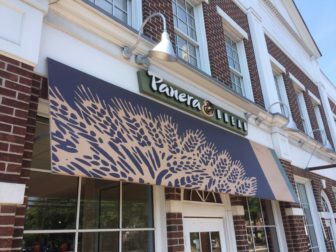 The owner of the building, Greenwich Manor LLC, has been informed that Panera doesn’t expect to renew its lease when it expires at the end of 2016, according to a person who spoke on condition of anonymity. Seven to nine full-time employees and another 18 to 25 part-time employees. The building sits on just over a quarter of an acre, with just over two dozen parking spaces in the back. 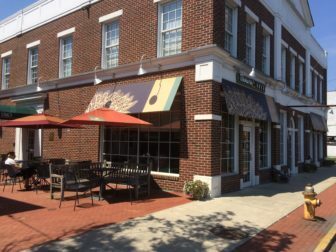 The space doesn’t seem to have been put on the market, at least publicly, although various Darien businesspeople have been approached to see if they’re interested in the space when it becomes available. In 2013, the building’s original owner, Thomas Golden Realty Co., sold it to Greenwich Manor LLC for $4.7 million. Greenwich Manor is owned by Pedram Hendizadeh, a Long Island podiatrist; Jonathan Peykar, who works for Nourisan, a rug manufacturer; and Rodney Rastegar, an oral surgeon on Long Island. Darienite.com left a message for Hendizadeh on Wednesday afternoon. Get our newsletter every weekday morning. Some space on the second floor of the same building is available for rent, with Christian Bangert of RHYS Commercial Real Estate listed as the agent. Darienite.com also left a messsage for Bangert on Wednesday afternoon. Chyten Tutoring, a test preparation and academic tutoring business, rents much of the second-floor space in the two-story building, and has been there since 2013. According to the Darien Tax Assessor’s Office, the building’s value was appraised at $4,362,6000 (actual, 100 percent value) for the 2013 town revaluation. A food-hall type situation would be cool here.